Nothing can take the place of a healthy set of teeth, but when periodontal disease or trauma causes the loss of these teeth, it is good to know you have an option for replacement of these teeth to restore your smile. Dental implants are designed to provide the foundation for replacement teeth that look, feel, and function like natural teeth. Dentures, bridges or individual teeth mounted on dental implants will not shift in your mouth- an especially important benefit when eating or speaking. The secure fit also helps replacement teeth feel more natural than conventional bridges and dentures. Dr. Sutherland has received extensive training in Implantology. He completed a 3 year periodontal residency in 2005 that focused not only on the treatment of periodontal disease but also dental implants. Dr Sutherland continues to keep up to date with the most current information through continuing education. Dental implants are metal posts, usually titanium, that are surgically inserted into the jawbone where teeth are missing. Titanium has proven to be very compatible with bone. The surface of an implant is treated with a substance that assists them in adhering to and fusing with the bone. Replacement teeth are then built on this dental implant foundation. 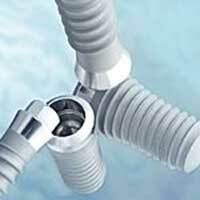 What Type of Prosthesis Do Implants Support? A single (prosthesis) crown is used to replace one missing tooth. Each crown attaches to an individual implant. If numerous teeth are missing, then a fixed bridge (partial prosthesis) utilizing two or more implants may be an option. If all of the teeth are missing in the upper or lower jaw, a complete removable or fixed prosthesis is recommended. The number of implants depends on which type of prosthesis is selected. The placement of dental implants may require two surgical procedures. First, dental implants are surgically placed into the jawbone using local anesthesia. General anesthesia is not required. For two to six months following the implant placement, the implant is below the gums and gradually integrating with the jawbone. A temporary prosthesis may be recommended during the implant healing process. After the implant has bonded to the bone (two to six months), Dr. Sutherland will uncover the implants by removing the gum tissue over the implant and placing a healing collar. After the gum tissue has healed for two weeks, your dentist is ready to start making your new teeth. A post or abutment will be attached to the implant for the replacement tooth to sit on. The dentist will take an impression to have the replacement tooth fabricated. The entire procedure for the implant placement to the final replacement tooth can take up to six to eight months. Most patients do not experience any disruption in their daily life. Utilizing the most recent advances in dental implant technology, Dr. Sutherland may be able to place single stage implants. This means a second surgical procedure is not required to remove the overlying gum tissue. The implant still needs to heal a minimum number of weeks to months before the dentist can place the replacement teeth. In certain circumstances, Dr. Sutherland can place the dental implant the same time a tooth is extracted to reduce additional surgical procedures. In very select cases, the patient may have the implant and a temporary crown placed during the same visit. Each case is unique and the initial evaluation allows Dr. Sutherland to determine which process is best for you. If, like many others, you believe dental implants are the right choice for you, we ask that you undergo an evaluation. As part of the evaluation Dr. Sutherland will examine the condition of your mouth, the supporting bone in your jaws, and the way your upper and lower teeth fit together. Dr. Sutherland will also gather additional information by taking dental x-rays and models of your teeth. This information will help determine what is required to make dental implants a success for you.